For qualified therapists wishing to add Thai Foot Massage to their range of skills. 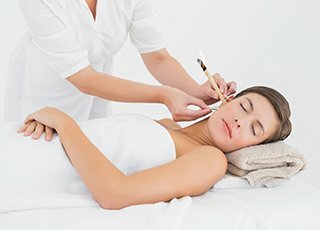 Be qualified to perform a traditional treatment. Know how to apply leg wraps as part of the treatment routine. Know about the SEN lines and history of the treatment. The Thai foot massage is a popular choice for therapists and reflexologists as a CPD course. Thai Foot Massage is a unique massage of the lower legs and feet that originated in Thailand over 2000 years ago. It is a traditional technique that has been handed down by word of mouth across the generations from father to son, from mother to daughter and from teacher to pupil. It is still taught today by Buddhist monks in the temples of Thailand. Thai Foot Massage is fun to learn and is a great add on to your existing practice as it produces a deep and unique feeling of balance, relaxation and well being. It involves hands on stretching, massage, use of a stick to stimulate reflex points and follows the Thai energy lines (SEN). It has elements of Shiatsu, Reflexology, Chinese massage and Yoga incorporated into the massage itself and is said to stimulate the activity of the internal organs. On the course you will have the opportunity not only to give a Thai foot massage treatment but to receive one also, giving you’re an opportunity to learn how wonderful the treatment can be for your clients. The History and development of Thai Foot Massage. An insight into Thai energy lines (Sen Lines). Step by Step procedure of a complete Thai Foot Massage sequence including the use of a traditional Thai stick. Entrance requirements: Students should hold an acceptable level 3 Anatomy & Physiology and either Body Massage or Reflexology. Qualification / Certification: Upon successful completion of the course you will be awarded a ‘Thai Foot Massage Diploma’ by Helen McGuinness Health & Beauty Training International. CPD Points: Our Thai Foot Massage Diploma accredited by the Beauty Guild, is worth 14 CPD (Continuing Professional Development) Points. Thai Foot Massage Course Questions ? You can compliment your Thai Foot Massage Skills with our Reflexology course, our Ear Candling Course, Our Swedish Body Massage course and our Thai Herbal Compress Massage course.